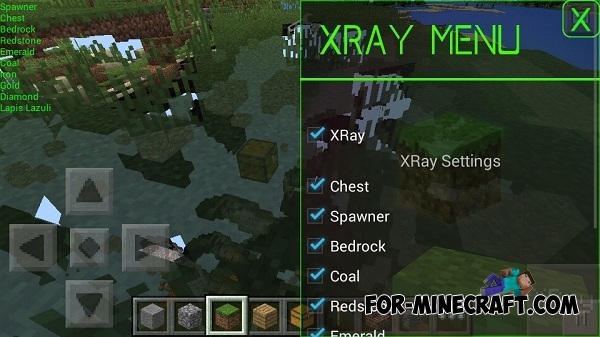 By installing this hack, you can fast find diamonds, iron, and other things without having to search for them digging the endless mine. Install the script, select the type of settings for X-ray and wait the loading of the world. At the moment, hack in the development stage, there may be bugs and crashes. Dino Mod for Minecraft PE 0.10.5At the moment mod is at an early stage of development, and it adds only one of the dinosaurs. 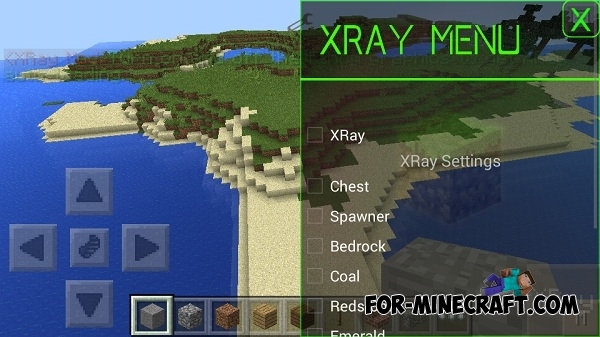 Useful v0.3 hack for Minecraft Pocket Edition 0.10.5Modification has many useful features! This mod is for serious gamers, who just want to try it, as well as for beginners who may need a little help during their first game. Ghost Hack for Minecraft Pocket Edition 0.10.4This is very useful, but also cheat script for Minecraft PE. With it you will be able to fly, run fast, making constant day, including invisibility, and much more. It works on servers.